This was not an easy book to get into, I must admit. Nevertheless, I read it, slowly but surely, and at the end, I must say it is a great book to read if you are a fan of José Saramago. This early book of his centres around the lives of the Mau-Tempo family, a family of peasant farmers, and their changing fortunes, over several generations. The story is set from the beginning of the 20th century, when Portuguese Republic was established, through the two World Wars, and up to the end of Salazar's rule. This book is perhaps the most autobiographical novel of Saramago, given that his own grandparents had lived lives very similar to the ones he portrays in this book. See, there isn't a single main character here. Rather, the whole Mau-Tempo family (Portuguese for bad weather) is the main character, starting from the patriarch, who was a travelling labourer, looking for work in whatever town was offering work, dragging his wife and child with him; to the lives of his sons, and grandsons, as well as their families and extended families. The narrative chronicles how the lives of farm labourers have changed from working from dawn to dusk, to the establishment of an eight-hour work day, as well as Labour Day. 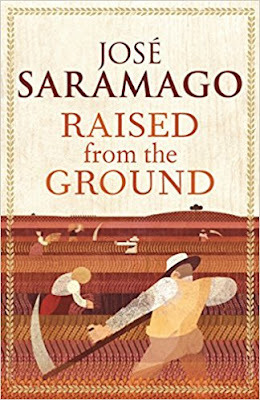 José Saramago was a Communist, and perhaps this novel sheds light on why the author has such views. The contrast between the farm owners and the farm labourers are stark. The status quo was that the farm owners needed workers to work their fields, and the workers were expected to show up at dawn and work all day long until dusk. When a labourer doesn't do that, they are branded as idlers, and are punished somewhat, since the farm owners and the police seem to be in cahoots. The salary of the farm labourers are quite low, and farm owners want to keep paying them lower and lower wages. Essentially, the labourers are pretty much treated the same as animals, or machines: if one body breaks, just replace it with another one. There's plenty of those available, after all. In this environment, the labourers eventually figure out that they need to work together and insist on some changes. Striking slowly appeared. People refused to work, asking for higher wages and an eight-hour work day. This tension and the eventual change that it brought up is the focus of this novel. And yes, it definitely doesn't paint a rosy picture for capitalist entrepreneurs, wanting to increase the contents of their coffers at the disadvantage of their workers. I only started liking this book after reading more than half of it. This book doesn't grip the reader, but then again, most of Saramago's novels are like this: they start slow, they evolve slowly, the suspense isn't there for the most part, but somehow, it tackles important social issues sometimes using allegories and fantastic what-if scenarios, and by the time the book ends, the character you thought was the main character at the beginning of the book is not there anymore. This is an early novel of his, which is interesting to read if you want to see how Saramago's narrative style develops along his works. So yes, like I said, I didn't like it at the beginning, but by the end of it I enjoyed this book a lot. I give it 3 out of 5 stars.